This class is for those design or engineering teams that have been forced to switch parametric software packages. We also understand you are probably upset, however we would like to make the transition as smooth and rewarding as possible in this one week intensive. This course makes the assumption you are experienced using Solidworks and that you need to get you up to speed quickly using Creo. Design Engine instructors help you learn Creo at a rapid pace and at a high level all in one week. Ask your account manager to work with the instructor slated for assistance with the course curriculum and customization process. Our instructors know both packages and can ease your learning experience, plus we will get through much more material in one week if everyone knows Solidworks already. For those companies facing change and want an unbiased non sales perspective, we offer a week long format to compare your models with respect to each Solidworks or Creo. Prerequiste: Participants should have a working knowledge of SolidWorks. Onsite Training: This, and all Design-Engine courses, are offered at our location or onsite at your facility. Call to speak to an account manager to arrange a class at 312.226.8339 today. 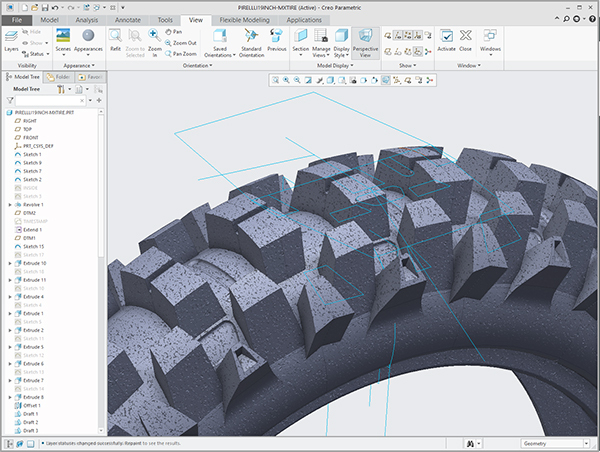 Creo sketch tools in contrast to how Solidworks uses curves. Building Selection sets with resepct to curves, sketches, surfaces, solids. Creating features: Extrude, Ribs, Lofts, Patterns, Shell and Draft, Fillets using Equations to manipulate parts quickly and detail drawings for documentation and assembly detail drawings complete with exploded views. Detailing Cross sections, exploded views etc. Cover basic surfacing complete with Sweeps and Lofts. Utilize Edit Sketch ie compares Edit Feature. Learn to edit parts (with certainty) that others have modeled. Learn to use drawings, not only to document models, but as design tools for controlling snap fit and accuracy. Assemblies with Creo to compare to SolidWorks. Advanced Assembly function in one package or the other ie. mechanism, top down design, configurations etc. Basic differences between Creo & SolidWorks. Discuss basic workflow similarities and differences and need to make changes quickly. Setting up designers and engineers to succeed. Part modeling workflow & technique (mirror pattern etc.). Making changes to how parts are assembled. Using assembly drawings to understand then manipulate parts in assemblies. Exploded Assemblies and automatic BOM. Top-Down Design: external copy, geometry, and or insert part. Auxiliary views & cross sections. Using drawings as tools to make rapid changes. Learn proper modeling techniques, to utilize drawings to aid in modeling, cross sections, exploded views, and the basics of surfacing. Compare and contrast SW solid bodies with Creo closed surface merges. Compare with examples building reference planes. Discuss systems options in detail. Examine editing parts others have modeled in both packages. Compare using surfaces by themselves and within parts. Group discussions designing mechanisms complete with surface detection. Compare surfacing tools (if necessary). 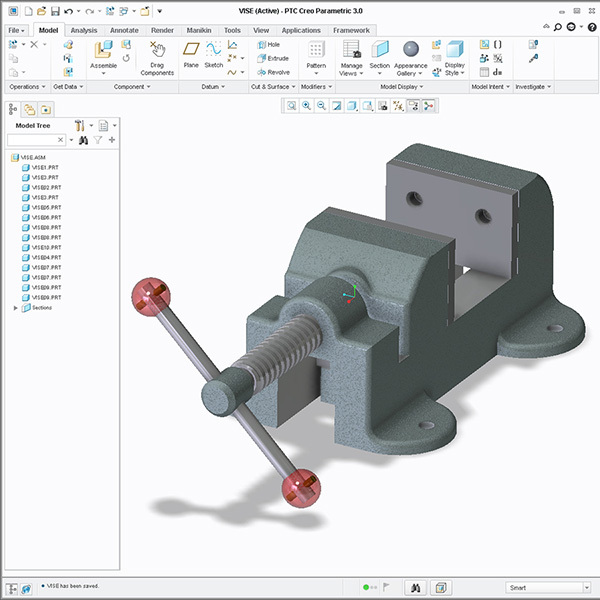 Compare Creo w/SolidWorks sheet metal with examples & exercises as necessary. Compare cross sections in both tools and create a few cross sections as example in both parts & assemblies. Did your company choose to switch design engineering packages? This course is for those who know one package already and have been tasked to learn the other. This is an introduction to constraint based modeling, assembly, detailing & making changes utilizing the latest release of the package you are switching to. This training course is developed for seasoned users who want to become proficient learning the new package all in one week. We help you learn the software, not read to you from an exercise book. In this course we help design engineers learn how to make changes quickly to set them up for becoming expert faster. As with all Design-Engine classes participants keep the training material login and password for life.